For new and prospective parents of children starting in September 2019 we will be holding several new parent's visits. This will give you the opportunity to come and see our lovely school and meet with our Head Teacher, Mrs Pietrzak, prior to applying for your child's place in Year R.
From November 1st you can apply online at www.hants.gov.uk/admissions where you will also find full information and guidance on the application process. Alternatively paper copies can be requested from the school office. The closing date for applications is Tuesday 15 January 2019. An in-year admission is when a child needs an immediate school place outside of the usual transfer times. In year applications can be made at any time. Please note however that applications will not be processed more than four weeks in advance of when the place is needed. You can apply online at www.hants.gov.uk/admissions where you will also find full information and guidance on the application process for in-year admissions. Paper copies of the application form can be requested from the school office. 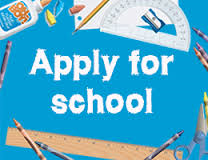 Before applying please contact the school office to make an appointment to visit our school and meet with our Head Teacher, Mrs Pietrzak. Our Admissions Policies can also be accessed via the link below. Parents can contact the school office directly on 01256 350300 or the Admissions Team by calling 0300 555 1377.